The Expectations vs Reality Jokes Are Never Too Old To Be Laughed On! The festival of colours and limitless masti, Holi is right here. Holi 2018 falls on March 2, Friday, which means we have a long weekend on our hands. Yes, it also means that we do not have to worry about all the stubborn blue-green and metallic colours on our faces. What makes Holi truly stand out is that it is devoid of rules and regulations associated with major festivals in India. No early baths or follow rituals. All one has to do is eat yummy delicacies, play with colours, dance on favourite Bollywood Holi songs and shout Happy Holi. Apart from all of the above, there is another exciting activity that almost everyone does during the colourful festival is send and receive funny Holi photos, jokes and greetings on WhatsApp. Yes, gone are the days when one just limited themselves to exchanging sweets. 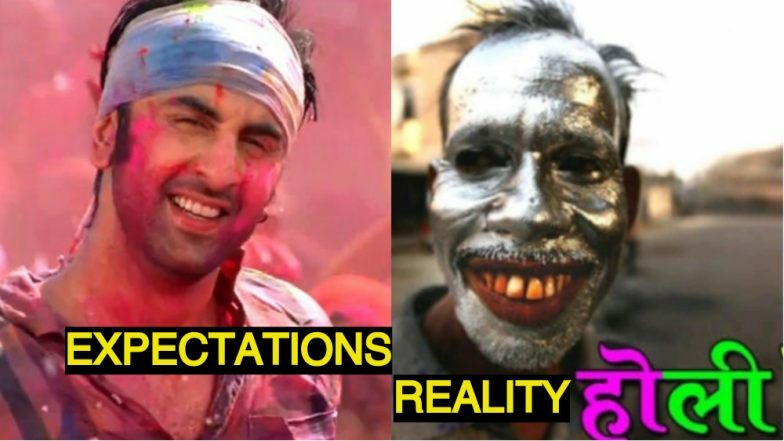 In today’s age and time, bring a smile to your friend’s face by sending most hilarious Holi images, GIF videos or tag them in Happy Holi memes on Facebook. Holi is the time to unwind yourself. It is one of the biggest Hindu festival, which is celebrated pan India. It is that time of the year when even enemies let go of their differences, hug each other and look forward to new beginnings. It is not just the colours but the spirit of the united country that adds charm to the celebrations. 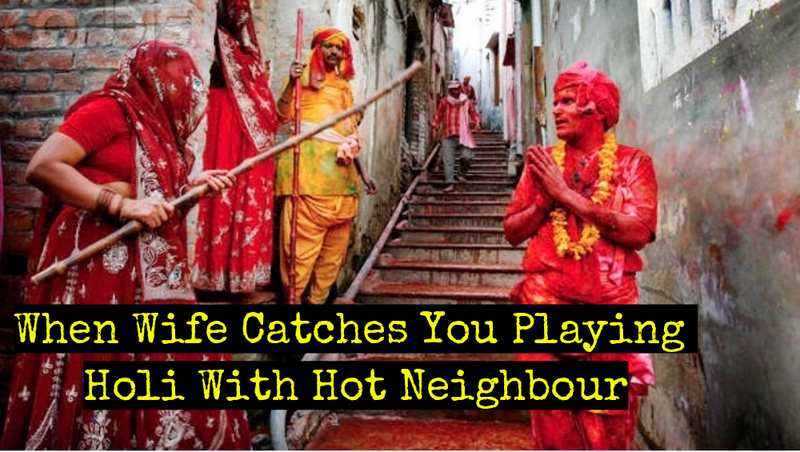 Over the years, Holi celebrations have become an integral part of the popular culture. From cinemas to serials; musical videos to paintings to poems, Holi is a part of everyone’s composition. 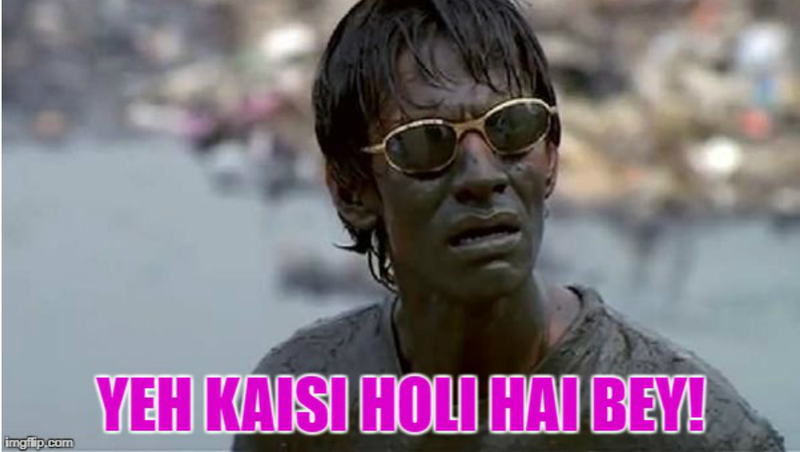 In a similar way, Holi has also found its place in the new-age humourists or shall we say meme-makers. There is no dearth of jokes and light-hearted humour around the celebration of this energetic festival. From Gabbar Singh’s famous question ‘Kab Hai Holi?’ in Bollywood classic Sholay to Ranbir Kapoor-Deepika Padukone’s Balam Pichkari, we have a spinoff aka hilarious spoof on everything. Here’s funny collection Holi photos, Whatsapp jokes and GIF image messages to wish Happy Holi 2018. 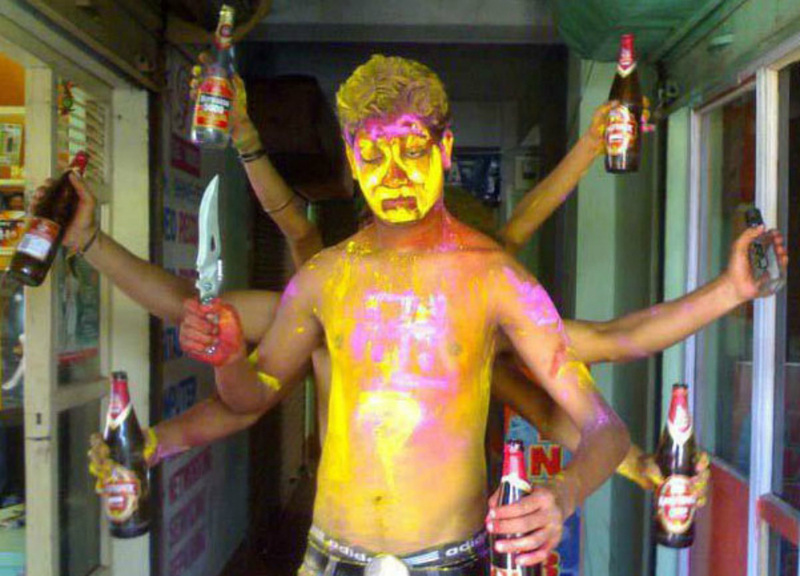 Gabbar Singh's 'Kab Hai Holi' Has Got Viru Mighty Pi**ed! 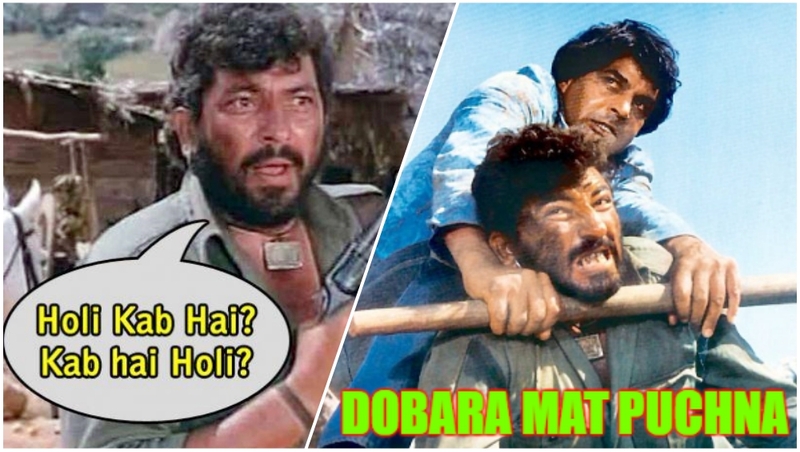 Gabbar Singh's Evergreen Dialogue 'Kab Hai Holi' Has Got Viru Seriously Annoyed! Is this what really happens in every household? 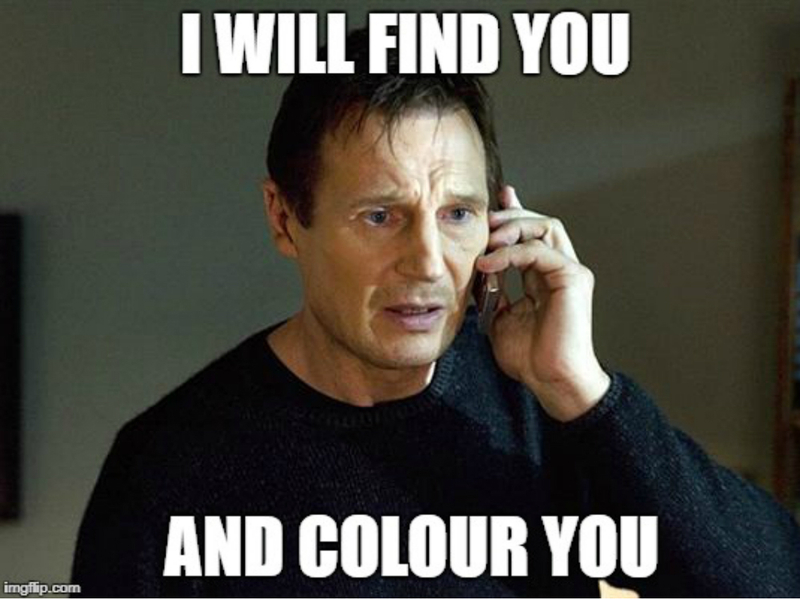 And, that one poor, victim friend who just cannot escape colour attack! 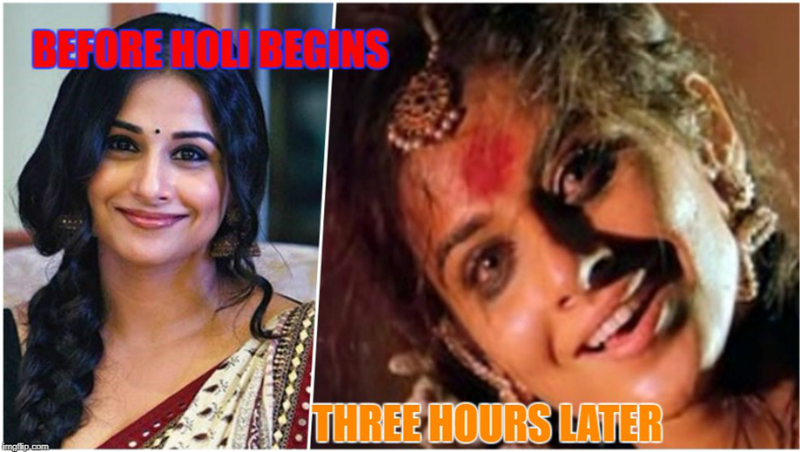 This picture sums us our most of Holi plans!! Go out and play with colours like you have never done before. For one day, forget all about the stress of professional commitments and enjoy like there’s no tomorrow. Make the day so memorable that when you look back at these selfies (of course, you are taking selfies), the snaps should instantly make you smile (like a fool) but it will be all worth it. And yes, masti is not equivalent to being reckless or hurtful. Wish you all a very Happy and Safe Holi 2018.